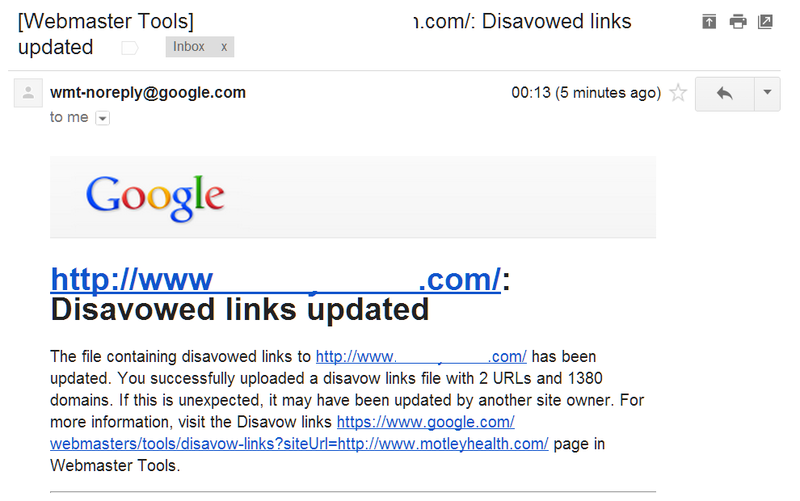 Today and uploaded another disavow file to Google Webmaster Tools. And a little afterwards, I received an email informing me that it had been processed. Not sure what processed means – does it mean that they will no longer count as links to my site, or that they will no longer appear as backlinks in WMT? Or does it just mean “thanks, we got it, now you will wait about six months to find out if it was worth the effort”? Hang on, what is Disavow? Any web pages or domains that are “disavowed” will have their PageRank nullified. Links from some websites / domains would be de-valued. So no PageRank would be gained by having links on them. Sites which are probably in this group are web directories. Why? Because there was a time when even Google said that web directories were generally OK. But abuse of them, manipulation etc. lead to spam. Directories were built to sell links etc. Links from some other sites are not just devalued, but they will harm your site. Google used to say that there is nothing a competitor can do to harm your site. Now it says something like (I am paraphrasing because I cannot find what they say…. ), there is not much a competitor can do to harm your site. Sites that have spun text / gibberish that are automatically created for the purpose of creating manipulative links. Sites that do not moderate comments and let links in them pass pagerank. Sites that begin with the letter P.
So, what happened? Why disavow tool? As soon as Penguin 1 rolled out in 2012 people started talking about “negative SEO” – people deliberately creating the spammiest, nastiest links possible to try to incur a penalty on another site. People complained to Google. Bing launched a disavow tool. Google followed! Google’s advice to anybody suffering either a manual unnatural link penalty or a Penguin algorithmic penalty is to try to get the links removed, and if this fails, disavow them with the tool. The webmaster does not want to remove it, it is there to harm you on purpose. The webmaster is no longer interested in running the website and is ignoring all emails. You have to wait for the domain to expire or webhosting to cancel the account. Some webmasters are charging a fee to remove the links. Google’s advice is to not pay, just disavow. How do we use the disavow tool? Pick your domain. Read the warnings. After uploading the file Google will confirm on the screen how many URLs and domains were added. Shortly after you will get an email like the one above. This is the million dollar question! Google have said in the past that Googlebot (the search engine spider that crawls the web – geddit?) will need to visit all the bad websites to check if the link is there, then look to see if you have added it to disavow, and if you have, they can discount it. What if you disavow good links accidentally? No problem. Google uses the last disavow file you upload and ignores the previous, so if you accidentally disavow a link from the BBC or NASA, fear not, just remove them from the list and upload a new file. Sounds crazy! Why can’t they just ignore them immediately and update your rankings? Dunno. People have had manual penalties revoked by Google after removing links and disavowing links. Nobody to date has made a proven recovery from Penguin after disavowing links. No. Some claim to have recovered, but the recovery is no more than 25% of the fall, and this could be attributed to new links, better content, improved site structure and navigation, fewer spammy adverts – all sorts of things. It is all very depressing really. Note, this is my take on disavow and not entirely based on facts, only opinions derived from personal, limited, experience.